If you've been reading my blog lately, you've seen that I am attempting to write more. I keep saying I am trying to write more creatively but honestly, I am just trying to write more which I hope will then lead to writing more creatively. I am attempting to create good habits and part of that is making more time to do the things that bring me joy. Writing is one of those things. Writing about just anything doesn't always bring me joy but strengthening the muscle of writing does. 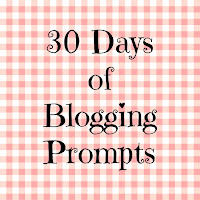 I am using the 30 days of blogging prompts that i stole found over at Covered in Grace. I told myself I wouldn't go in order but it actually helps to go in order because it takes the stress out of making decisions. Today's topic: Describe your relationship with your parents. My parents and I have differing beliefs on many things; Sometimes in politics, many times in religion but at the end of the day our respect for each other is so high that we can look past those differences and see the value in the other. My parents are very generous, loving and encouraging people. They are also very patient. Regardless of how they feel about what you are doing with your time or life, they encourage you to do or be who you are meant to be. I admire them for the way they love my brother and I! I am not sure when the switch happened... you know the one... where they are no longer your annoying parents but people you admire. Almost all of us deal with it. Our need for independence builds up a wall even with the BEST OF PARENTS. We think we know better, they know they know better so there is tension. I am not sure when it was that I realized that i really like these people as people and not just my parents but it definitely happened. My first memory of the fruits of that was when they took me to the virgin islands. Just the three of us. We had so much fun. Yes they spoiled me but it was more than that. I enjoyed my time with them not as parents but as friends. That switch was beautiful for me. They are still my parents and I still have a respect for them as any child should have for their parents but when I realized that they were also my friends was when the great relationship happened. I am very grateful for my parents. They sacrificed a lot for me and my brother including their time, resources and sometimes their emotional wellbeing. I often feel sad that so many people out there don't have that relationship with their parents. Not to devalue the life they have but I am so grateful for mine that I wish everyone had the opportunity. Thanks for stopping by! If you are a new reader, leave your link below. I'd love to check your blog out. I love that moment when you realize your parents are the bomb I think that's when we truly become adults and realize that though parents make mistake they do a lot to raise us. As a mom now I finally get it.